With more summer like weather upon us, I find I’m getting out and about more often. Even though it is a late April day here in Houston, it feels more like a hot July day in Maine. For today’s get-out-and-about adventure, I decided to attend the San Jacinto Day Festival and Battle Reenactment. I’m not much of a history buff per say, but once you learn about what transpired here on April 21, 1836, you leave with a greater appreciation of how significant this event was and how vastly different our country might be today if Santa Ana and his army had been able to mount a successful counter-attack. It was on this prairie at 4 p.m. that General Sam Houston gave the final order for his ragtag army of 800 men to attack Santa Anna's encampment of 1400 men. Even though Santa Ana had success at Goliad and the Alamo, it was here at San Jacinto that his ill-fated expedition into Texas came to an end. Unprepared for the kind of fighting that Houston had unleashed upon them, Santa Ana and the soldiers of the Mexican army fled in every direction to avoid being killed. When the battle ended 18 minutes later, Santa Ana had lost over 630 men, with many more wounded and captured. Among the captured was Santa Ana, whose identity was given up by his own soldiers. Houston’s army? Only 6 casualties and 13 wounded. 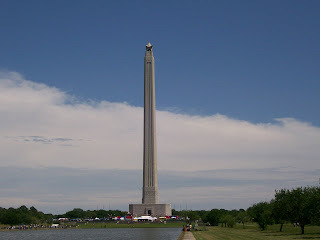 To later commemorate this event, the San Jacinto monument was constructed during a three year period from 1936 to 1939. At 570 feet, it is the world’s tallest war memorial, and is 15 feet taller than the Washington monument. Topping the monument is a nine point, 35 foot star that weighs 220 tons. Equally impressive, though, is its art deco design, and the material it is constructed from: a combination of cement and steel, faced with Cordova shell stone quarried from Burnet County, Texas. With the battle cry, ‘Remember the Alamo! Travis at the Alamo and Fannin at Goliad. After I read all eight inscriptions, I went into the monument and purchased a $4 ticket for an elevator ride that takes you 500 feet up to the observation deck. It affords an incredible view of the ship channel, the refineries, and on a clear day, the skyline of Houston. Today was a bit overcast and as such Houston was barely visible, but even still, you come away with a good impression of just how vast the Houston metropolitan area is. With a half hour to go before the battle reenactment began, I headed over to the food court and ordered a barbecue chipped beef sandwich with a bag of chips. For 5 bucks, it was a pretty good deal, but I’m not sure about the 3 dollars charged for a 20oz bottle of water. Seems liquid is becoming a high priced commodity these days no matter what form it is in. After I finished eating, I strolled on over to the battleground. When I stumbled upon the Texian camp, it was as if I were transported back in time. People were costumed in period dress, and quite a few were grouped outside their tents attending to cook fires, and listening to stories of the day. The calm setting didn’t last long when a cannon shot indicated that the battle was about to begin. First to be reenacted were the events that preceded the battle. A voice cried out, “Santa Ana is coming! Santa Ana is coming!” And with that a procession of scarred settlers, who had heard about the news of what happened at Goliad and the Alamo, gathered up what few belongings they had and began to flee eastward toward Louisiana. A little girl who was sitting on the ground in front of me covered her ears when the musket shots started to ring out. A young boy about six or seven took out his guns made from carved wood and started shooting at the Mexican Army. One of the riders on a horse came up suddenly fast within twenty feet of the rope before stopping and then making a quick turn back to engage the enemy. It was enough to cause the little girl in front of me to let out quite a shriek. The air, filled with the thick haze and acrid smell of gunpowder, brought back memories of when I was in infantry training with the Marines. I remembered an exercise we had completed when the sergeant came up to us and said, “Remember, always take the fight to your enemy.” On that day of April 21, 1836, that is exactly what General Sam Houston and his army did to Santa Ana. Imagine that. A million square miles acquired in a matter of eighteen minutes. Perhaps a little exaggerated, but even still, the magnitude of that eventful day cannot be ignored. I swigged the last of my three dollar bottle of water, and headed for downtown Houston to Little Napoli Ristorante on Texas and Main for a quiet dinner of veal parmigiana served with capellini pasta. As I sat at my table on the patio in view of Houston's tallest buildings, I wondered what might be here instead had it not been for General Sam Houston’s decisive victory over the self-styled "Napoleon of the West." Great post, as always, Scot. Having relatives scattered throughout Texas, I'm familiar with the state's history. But I never knew this monument existed. Thank you for sharing this with us. You're welcome. I can remember my first impression when I saw the monument. I never heard of it before, and yet you wonder how can something so large and representing something so significant not be known? It's like Houston's best kept secret. thanks for the walk through Houston; I used to live in a city where there had been a famous and equally historically significant battle--on the Plains of Abraham in Quebec City. Which is why I'm writing you in English instead of French. History can be a fascinating subject sometimes, especially with the history of the area you are living in. The battle on the Plains of Abraham in Quebec City was, indeed, significant in that had it not been for the "perfect volley" by the British troops under Wolfe, the outcome might have been completely different. Scot long time no see, and thanks for visiting. You sure made a total life change. How is your son doing in the military. Email me at EuroYank2005@yahoo.com. Am curious what happened to you and your long absence since your move.